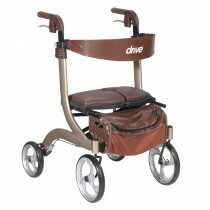 Folding walkers are available in various heights that typically range between 30-42 inches. Choosing a height that is suitable for your elderly loved one is simple because most manufacturers of folding walkers list information about their products' heights that is easy to compare. Many folding walkers have trigger releases that allow users to fold their walkers quickly and safely. Choosing a walker that has these releases is worthwhile because it can prevent users' hands from being pinched while they fold their walkers. Many high-quality folding walkers are constructed using lightweight aluminum frames that are designed to be durable without sacrificing a user's ability to push the walker safely. Choosing these frames for your walker is recommended because they offer a durable design that is easy for most elderly people to use. 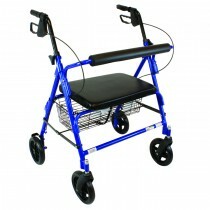 Most folding walkers have wheels that are designed to allow users to push their walkers safely with minimum effort. Searching for folding walkers that have wheels is a great idea because it can help your elderly loved ones find walkers that are easy to use. Many high-quality folding walkers also have padded hand grips that are designed to reduce hand fatigue. These hand grips are a wonderful value because they offer the comfort needed to use a folded walker on a regular basis that can help you elderly loved one feel confident about using a walker. As you can see, choosing a folding walker for your elderly loved ones is easy if you remember to select a folding walker that offers the right height and design elements that suit your elderly loved ones' needs. Be sure to use the suggestions mentioned in this article to choose a folding walker that offers your elderly loved ones the right height and design elements that suit their needs.